A sample of Pure Evil was obtained from the ruins of an exploded toaster in the south of England. 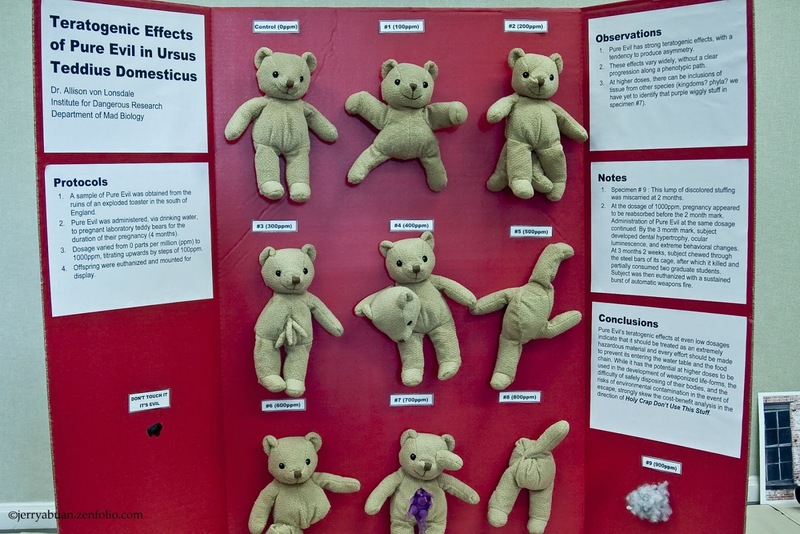 Pure Evil was administered, via drinking water, to pregnant laboratory teddy bears for the duration of their pregnancy (4 months). Dosage varied from 0 parts per million (ppm) to 1000ppm, titrating upwards by steps of 100ppm. Offspring were euthanized and mounted for display. Pure Evil has strong teratogenic effects, with a tendency to produce asymmetry. These effects vary widely, without a clear progression along a phenotypic path. Specimen #9: This lump of discolored stuffing was miscarried at 2 months. At the dosage of 1000ppm, pregnancy appeared to be reabsorbed before the two month mark. Administration of Pure Evil at the same dosage continued. By the 3 month mark, subject developed dental hypertrophy, ocular luminescence, and extreme behavioral changes. At 3 months 2 weeks, subject chewed through the steel bars of its cage, after which it killed two graduate students. Subject was euthanized with a sustained burst of automatic weapons fire. Pure Evil's teratogenic effects at even low dosages indicate that it should be treated as an extremely hazardous material and every effort should be made to prevent its entering the water table and the food chain. While it has the potential at higher doses to be used in the development of environmental contamination in the event of escape, strongly skew the cost-benefit analysis in the direction of HOLY CRAP DON'T USE THIS STUFF. That most people encounter a forced religious / spiritual perspective right out of the womb... It becomes the first filter they look through, in order to process reality. The less InQuisitive ©®ᵀᴹ (lower I.Q. http://goo.gl/kHmBg ) are not only less able to step out side of that perspective, but are more inclined to cling to it at all costs. The perspective goes from a looking glass to a by-proxy / default hiding place (http://goo.gl/rzet5). For these people, it is far easier to unquestioningly call something a ghost if one has already been told that it must be a ghost. what you need is someone strong to use you..
Certain philosophical processes may come in to play... But - that in-and-of-its-self is not religion. Admittedly most of the popular philosophies have been codified, edified and turned in to an administered product. I point to Zen-Buddhism as being a prime example. The Secular approach has great potential for helping a person to gain a cleaner and clearer perspective. The non-secular version has taken a simple concept and turned it in to a religious practice that convinces the individual to look outward for something that resides within. The crux being that if you have been told from an early age that deism is the extent of existence, it very unlikely that such a perspective is capable of thinking outside that box... Thus all answers related to avarice or adversity (and everything in between) must fit through the buttonhole that deism creates. Few who live with that perspective are even capable of understanding its limitations. Those who understand that it is unreasonable to take religion literally, are by default, assuming at least some degree of secularism. So secular vs. non-secular. Where the secular recognize their choice, they also recognize the 'choice' that the non-secular makes, and why. Atheism - The belief that there was nothing and nothing happened to nothing and then nothing magically exploded for no reason creating everything and then a bunch of everything magically rearranged itself for no reason which then turned into dinosaurs. It is sarcastic... Which is always nice to see... But its wit is still an Argument from Ignorance. It is saying that if you don't immediately know the answer... Then the answer must therefore be supernatural! Spirituality at-large relies (almost solely) on its adherents completely ignoring the collision created when estimating a line of reasoning against the 'Argument from Ignorance'. Seeing the inanity of this approach does not even require invoking baseline pragmatism. It is self-evident. Though, the Spiritualist and Deist don't even realize that this is what they are captivated by.